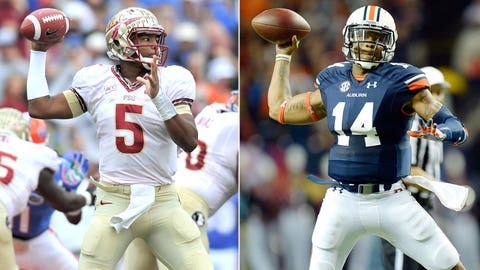 What will the bowls have in store for Auburn's Nick Marshall, Boston College's Andre Williams, Louisville's Teddy Bridgewater and South Carolina's Jadeveon Clowney? A bowl season can truly be defined by the surprises it brings. They can come in the play itself, like Utah dominating Alabama in the 2009 Sugar Bowl to the infamous Fumblerooskie. They can come on the peripherals, with Ian Johnson dropping to one knee to propose or Woody Hayes dealing a blow to Charlie Bauman. But the bottom line is, they will come, it’s just the figuring out when and where that’s the tricky part. Here are 35 bold predictions for a bowl smorgasbord with 35 games (which in a strange coincidence, is also the 35th anniversary of that Hayes-Bauman incident), going from the first game to the last. 1. Washington State’s Connor Halliday will throw for more yards than anyone this postseason and he’ll do it in the opening game, torching Colorado State’s 109th-ranked pass defense in New Mexico. Who do you have the most faith in this bowl season? Jay Clemons makes his picks and ranks the games based on confidence level. 2. Buffalo make history with the program’s first bowl win, beating San Diego State in the Potato Bowl. Keep in mind this is just the Bulls’ second appearance as they lost the ’08 Independence Bowl to UConn. 3. Tulane’s Nick Montana will equal if not pass his Hall of Fame father in the Superdome. Joe Montana threw for a then-record five TDs in Super Bowl XXIV and his son will have a huge day vs. Louisiana-Lafayette (81st in pass D) in the New Orleans Bowl. 4. Biletnikoff Award winner Brandin Cooks, he of the FBS-best 1,670 yards and 15 TDs, will be kept out of the end zone by Boise State in the Hawaii Bowl. It’s already happened to the Oregon State WR three times, including in two of the last three games. 5. The interim coaches will go unbeaten. Five teams are playing with fill-ins in Arkansas State (John Thompson), Boise State (Bob Gregory), Bowling Green (Adam Scheier), USC (Clay Helton) and Washington (Marques Tuiasosopo). 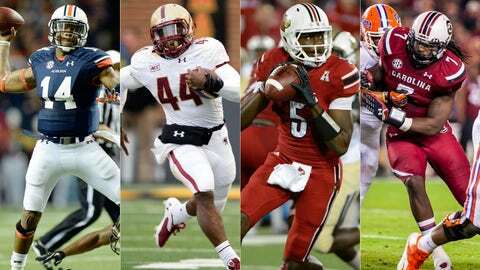 In the past 18 bowl games, coaches taking over in-season have gone 7-11 and these guys will buck the trend. 6. Jordan Lynch is denied history. Needing 119 rushing yards to become the game’s first 2,000-yard passer/2,000-yard runner, the Northern Illinois QB will fall short against Utah State in the Poinsettia Bowl. The Aggies, who are 10th vs. the rush, haven’t allowed a RB to get more than 115 all year. 7. Marshall hasn’t won 10 games since Byron Leftwich was at the controls, but a Military Bowl matchup with a Maryland team that lost four of its last six and is without WR Stefon Diggs will change that. 8. The Texas Bowl will be a showcase for … QBs? Minnesota is last in the Big Ten in passing and Syracuse is third worst in the ACC. But two defenses that are below average in pass efficiency D will set Philip Nelson (Gophers) and Terrel Hunt (Syracuse) free. 9. Rutgers spoils Notre Dame’s return to the Bronx. The Fighting Irish are 16-6-3 all-time in buildings bearing the Yankee Stadium name, but they have yet to play a postseason game there. Paul James (833 yards, nine TDs) and the Scarlet Knights will take advantage of a Louis Nix-less defense. 10. Ryan Switzer is tied for the ACC single-season record with four punt returns for a TD and the North Carolina freshman adds a fifth vs. Cincinnati — 112th in punt return defense — in the Belk Bowl. 11. Teddy Bridgewater was once committed to Miami before pulling his verbal after Randy Shannon was axed. Facing the team he almost played for in the Russell Athletic Bowl, and whose defense is struggling, the Louisville QB will break his individual passing yards record of 424. 12. On the heels of his 451-yard passing day against Ohio State, Devin Gardner will have another monster game against Kansas State in the Buffalo Wild Wings Bowl, setting off (whether realistic or not) plenty of offseason Heisman Trophy talk. 13. Already the single-season record-holder with 29 TDs rushing by a QB, Navy’s Keenan Reynolds will have his third game of four or more scores vs. Middle Tennessee State in the Armed Forces Bowl. 14. Georgia Tech’s David Sims is 154 yards from becoming the program’s first 1,000-yard rusher since Anthony Allen in ’10. But Ole Miss, which held Auburn’s Tre Mason to 77 and LSU’s Jeremy Hill to 64 won’t let him get there in the Music City Bowl. 15. Mack Brown will go out with a win. Oregon is a 14-point favorite in the Alamo Bowl, but Texas, behind Jackson Jeffcoat (12 sacks; 21 tackles for loss) will keep Marcus Mariota and Co. out of rhythm. 16. Texas Tech’s Jace Amaro needs 89 yards to break James Casey’s (Rice) single-season record for receiving yards by a tight end (1,329). He’ll get that and then some in the Holiday Bowl vs. Arizona State, which gave up 517 yards to Stanford the last time out. 17. Boston College’s Heisman finalist Andre Williams (2,102 yards) and Arizona’s Ka’Deem Carey (15 straight 100-yard games) will both go over 200 yards rushing and combine for 60 touches as they meet in the AdvoCare V100 Bowl. 18. Along with his 200-yard days with Carey, Williams will also be part of another interesting cliff note with Baylor’s Lache Seastrunk, as the two backs get their first reception of the season. 19. UCLA RB/LB Myles Jack, the Pac-12’s Freshman of the Year on both sides of the ball, will score both an offensive and defensive touchdown against Virginia Tech in the Sun Bowl. He would be just the fourth player since ’06 to score both ways. 20. Rice gets to 11 wins for the first time ever. Coach David Bailiff has already led the Owls to their first bowl wins since 1953 and how he’ll reach a new high in dropping Mississippi State (3-5 in SEC) in the Liberty Bowl. 22. Duke will top the Aggies. David Cutcliffe and Co. will cap a dream season by claiming their first bowl victory since beating Arkansas in the Cotton Bowl in 1961. 23. Despite his AD’s backing, the Gator Bowl will be Bo Pelini’s final game at Nebraska. Mired in a season in which he didn’t live up to expectations and had a tape leaked of him rating about Cornhuskers fans, the final straw will be a blowout against short-handed Georgia. 24. UNLV remains perfect in bowl games, with QB Caleb Herring (25 TDs) sinking North Texas in the Heart of Dallas. The Rebels haven’t been to a bowl since ’00 and are in their fourth since 1984, but are 3-0 all-time. 25. Iowa holds LSU’s offense in check. The Hawkeyes rallied from a 5-4 start to make the Outback Bowl behind a seventh-rated defense. They get a Tigers squad that is explosive, but has a QB in Anthony Jennings making his first start. 26. Jadeveon Clowney will double his sack total in the Capital One Bowl. Granted, the preseason All-American has only three, but he’ll get that many as South Carolina faces Wisconsin. He’ll also give us a memorable hit to supplant this one. 27. South Carolina’s Mike Davis has more yards than Wisconsin’s Melvin Gordon or James White. Davis ran for 1,134 yards, while Gordon and White both surpassed that with 1,466 and 1,337, respectively. But with a more consistent passing game than the Badgers, the Gamecocks can keep Wisconsin on its heels and give Davis room to run. 28. Despite boasting the nation’s No. 1 (Michigan State) and No. 14 (Stanford) defenses, the Rose Bowl won’t be the lowest-scoring BCS game. That honor will go to the Sugar with overmatched Oklahoma and not-happy-to-be-there Alabama, which thought it would be playing for a national title. 29. Baylor will produce the largest margin of victory ever in a BCS bowl as it trounces UCF in the Fiesta Bowl, breaking the record of 37 set by West Virginia when it beat Clemson in the 2011 Orange Bowl. 30. Oklahoma State (39.8 points per game) and Missouri (39.0) will produce the most combined points of any game in the Cotton Bowl, followed by Washington (38.5) and BYU (31.3) in the Fight Hunger Bowl. 31. Carlos Hyde, not QBs Braxton Miller (Ohio State) or Tajh Boyd (Clemson) will steal the show in the Orange Bowl. The Tigers’ 49th-ranked rush D (152.6), which allowed 154 yards to Georgia’s Todd Gurley, will have its hands full with the Buckeyes’ 1,400-yard rusher. 32. Vanderbilt’s Jordan Matthews will have his first 200-yard receiving day against Houston in the Compass Bowl. The Cougars are 114th vs. the pass, allowing 276.2 per. 33. The Longhorns name their next coach on the day of the BCS title game. Stealing some of the thunder from the Heisman ceremony with Brown announcing his resignation that afternoon, Texas will do the same and swipe the spotlight from Auburn and Florida State. 35. Auburn will make it eight straight BCS titles for the SEC. Taking the Seminoles, whose average margin of victory is 42 points, out of their comfort zone, the Tigers will keep it close and produce one last big of late-game magic to keep the SEC on the throne.